XtreemOS is a Linux-based operating systems that includes Grid functionalities. It is characterised by properties such as transparency, hiding the complexity of in the underlying distributed infrastructure; scalability, supporting hundreds of thousands of nodes and millions of users; and dependability, providing reliability, highly availability and security. Thursday afternoon is dedicated to discuss research topics with PhD and MSc students attending the School participants. 14.05 Syed Raheel Hassan: "Managing security of grid architecture with a grid security operation center"
14.25 Jakob Blomer: "A software distribution network in a virtualized infrastructure"
14.45 Boriss Mejias: "Beernet: a relaxed-ring approach for P2P networks with transactional replicated DHT"
15.05 Jesus de Oliveira: "Dynamic process reorganisation for a grid-wide DSM data sharing service"
15.55 Raphael Poss: "Fine-grained parallelism with SVP"
16.15 Xiaobin Xiao: "Towards an auxiliary agent architecture for cloud computing"
The XtreemOS Summer School will take place at Wadham College, University of Oxford, in the UK. 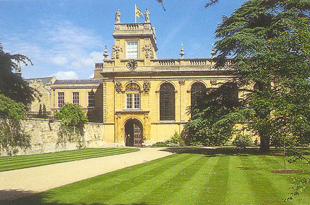 Wadham College is located in the centre of Oxford, directly opposite the Bodleian Library. The College is within 10 minutes walk from the central bus station. Information about how to get to Oxford and to Wadham College is available at http://www.wadham.ox.ac.uk/about-wadham/getting-to-wadham/finding-wadham.html. Oxford is an ancient university town recognised by its colleges, museums and beautiful gardens. More information about Oxford is available at http://www.visitoxford.org/. Students and post-docs, as well as scientist, interested to attend the XtreemOS Summer School 2009 are kindly invited to fill out the registration form that is available below. Alternatively, an application form can be requested (and submitted) by e-mail at summer09@xtreemos.eu. The deadline for registration is July 26th, 2009 * extended to August 5th, 2009 * -- Registration is now over. The fee for the school is 275 British Pounds (GBP). It includes accommodation in standard single room, breakfast, lunch (from Tuesday 8th), and participation in social activities (Welcome reception on Tuesday 8th, and Social Dinner on Thursday 10th). *** The deadline to request grant is now over: we will not be able consider any additional grant request *** A small number of grants are available which will be awarded to candidates whose financial circumstances might otherwise prevent them from attending the school. The grants can only be used for a (partial or full) waiver of the fee. Requests for support need to be accompanied by one letter of support written by a senior scientist (preferably your University supervisor). All material needs to be sent by email to summer09@xtreemos.eu. The participants are expected to plan their arrival on the Monday morning, September 7th, 2009, and their departure on Friday afternoon, September 11th, 2009. Lunch on Monday will be provided at 13:00 GMT. If you wish to arrive on Sunday, September 6th, or departure on Saturday, September 12th, you can do so by paying an extra fee for accommodation on those days. Participants are encouraged to bring their own laptop, which is especially useful since several sessions include practical training and hands-on exercises. The XtreemOS Summer School is an official activity of the EU XtreemOS Project. The XtreemOS Summer School contracts with Wadham College for the use of facilities, but which has not formal connection with the University of Oxford.